Well cared for home in a popular Brandon neighborhood! This 3/2 split plan home features a beautiful wood floors, an open floor plan, formal dining, and upgraded crown molding. The dining room opens up to a spacious kitchen with lots of counter and cabinet space. The master bedroom and bath make this home stand out. You'll find tray ceilings, a large jetted tub, dual vanities, a separate water closet, and a large master closet with awesome built-ins! This is a well-built home with lots of attention to detail. This home is 1708 square feet and offered for $188,500.00. Call 601-540-1197 to schedule your showing today! Stunning four bedroom home on a quiet street in Eastgate! This split plan home features a foyer, a large family room, and a formal dining room. The updated kitchen features slab granite countertops, stainless steel appliances, and lots of counter and cabinet space. The spacious master bedroom has tray ceilings and fresh paint in a nice, neutral color. The master also opens up to the back patio and deck! The master bath features a jetted tub, separate shower, double vanities, and a separate water closet. On the other side of the house you will find three spacious bedrooms. These bedrooms are not the tiny ones you get in some new construction. In the back you will find a freshly painted deck. You will not find back yard neighbors, because this house backs up to a wooded area! This house has tons of curb appeal and won't last long. 2102 square feet / offered at $229,900.00. Call 601-540-1197 to schedule your showing today. Immaculate new listing in gated Cornerstone! This home is better than new. It has tons of curb appeal with meticulous landscaping and a large corner lot. Inside you will find almost new wood floors, neutral colors, and fresh paint throughout. The large dining room has plenty of space for your extendable table and china cabinet. The spacious kitchen has slab granite counter tops, a large island, and tons of counter and cabinet space. The master suite features a bathroom with dual vanities, an enormous closet, a tiled separate shower, and a garden tub. Upstairs is a large fourth bedroom / bonus. All bedrooms in this house have walk-in closets! Step out back to see what really sets this house apart from others in the neighborhood. This listing has one of the largest back yards in the neighborhood, a large covered patio with ceiling fans and cable hookups for your television, a brick fireplace, and no neighbors behind your back fence! Cornerstone offers as much for your family as any neighborhood you'll find with its swimming pool, playground, tennis courts, clubhouse, and lake. Don't let this one get away. Call 601-540-1197 to schedule your showing today. This listing is a luxurious waterfront property in gated Johnstone. This custom home has all of the upgrades and extras. With seven bedrooms, five and one half baths, and over 7600 square feet all situated on a 3.6 acre waterfront lot, this is the dream home you've been looking for. Offered by Williamson Real Estate at $1.599 million. Qualified buyers call 601-540-1197 for your private showing. Stunning like new home in Abundance Pointe! Featuring exposed brick and upgraded granite, this home stands out from the rest. Just off the foyer is the office with a beautifully finished built-in wood desk. The large living area has pine floors, high ceilings, a gas fireplace, and built-ins. Gorgeous exposed brick columns are connected by a cypress beam to separate the living area and kitchen. The spacious kitchen features a large island, slab granite, and subway tile backsplash. Just off the kitchen is a large dining area and a separate pantry! The master bedroom leads to a master bath with a beautifully tiled shower and jetted tub, granite counter tops with his and her vanities, and a huge master closet with functional built-ins including a mirror. The fenced back yard has a covered patio with a pine ceiling. Just down the street is the awesome community pool! This home won't last long. Offered at $239,900.00. Call 601-540-1197 to schedule your showing today. Stunning 4br/2.5ba home in Asbury Lane Village! This award winning home features an open floor plan that's great for entertaining. Upon entry you will find a dining room to the right, then a living area with custom built-ins and a gas fireplace. The living room opens up to a breakfast nook and kitchen with a large island, a breakfast bar, custom cabinetry, and plenty of slab granite counter space. The owners spared no expense with custom window treatments and plantation shutters that will stay with the house. The master bedroom is spacious and features a beautiful pine tray ceiling. The master bath has his and her granite vanities, a whirlpool tub, separate shower, and a large walk-in closet with built-ins. Upstairs you will find the 4th bedroom/bonus, complete with a large walk-in closet and half bath. The two spacious downstairs bedrooms share a bathroom with his and her vanites and more granite countertops. Step out the back door to find one of the largest covered patios in the neighborhood and a wonderfully landscaped and flat back yard. Living in Asbury Lane Village gives you access to the beautiful clubhouse and community pool. This is not your cookie cutter home. Offered at $269,900.00. Call to schedule your showing today. Immaculate one owner home in the heart of Madison! Located in a quiet cul-de-sac in sought after Summertree, this house has been meticulously cared for. Situated in a corner lot, the beautiful landscaping immediately draws you in. Enter into a large foyer with hard wood floors, high ceilings and a beautiful staircase. The wood floors continue into the dining room and great room. The dining room has plenty of space for your drop leaf dining table and china cabinet. The spacious great room features beautiful built in book cases and a fireplace. In the kitchen you will find a granite island, double ovens, a beautiful exposed brick arch, and a breakfast area. You will love the master bedroom, with it's vaulted ceilings, wet bar, and adjacent sun room.The master bathroom includes a whirlpool tub, double vanities, and dual walk in closets. Upstairs you will find three more large bedrooms with great closet space and a bathroom with dual vanities. Relax on the large and well-maintained back deck, or in the front porch swing. You can also head down the street to the neighborhood pool, tennis court, and lake! This house won't last long with its combination of size, price, and location. 4br/2.5ba and 3028sqft. Offered for $318,000.00. Call and schedule your showing today. Immaculate 3/2 with a great open floor plan in Northwind of Wellington. Beautiful wood floors, high ceilings, and a brick fireplace are highlights of the spacious living area. The kitchen has slab granite countertops, stainless steel appliances, and plenty of counter top space. The large master bedroom with its tray ceiling leads to a master bath with dual vanities, a jetted tub, and a great walk-in closet. You'll never run out of water with your tankless water heater. On the other side of this split plan house are two more bedrooms and a shared bathroom. Out back is a big back yard and a covered patio. Don't miss this rare opportunity at under $200k. Offered at $199,500.00. Call 601-540-1197 schedule your showing today. Custom-built in Belle Oak and loaded with features! This 4br/2.5ba split plan in peaceful Belle Oak is one of a kind with great curb appeal and top notch landscaping. Step inside to a living area that features a heart of pine ceiling and a brick fireplace. A beautiful brick archway provides separation from the living room to the kitchen. In the kitchen you will find granite counter tops, a two-tiered granite island, custom cabinetry, a built in ice-maker, and a pot filler faucet. This home has a dining area that's big enough for your drop-leaf dining room table and china cabinet. The spacious master bedroom has tray ceilings with beautifully finished heart of pine. The master bath features his and her vanities, a jetted tub, a tiled shower, and a large walk-in closet with handy custom built-ins for storing and organizing. And with the tankless water heater, you'll never run out of hot water. Upstairs you'll find a fourth bedroom/bonus complete with a bathroom. The upstairs closet also has custom built-ins for gun and fishing pole storage. On the other side of the house you'll find two bedrooms with ample closet space and a bathroom with more granite counter tops. This awesome back yard has a large covered patio, an extended slab for extra seating, beautiful landscaping, and an amazing brick outdoor fireplace. You won't have neighbors looking into your back yard in this one, because it backs up to woods! The garage is oversized and fits two cars very comfortably. This is a custom home with an awesome floor plan that doesn't look like all of the others in the neighborhood. It has an alarm system, pre-wiring for a generator, neutral colors throughout, and it's move-in ready. Offered for $273,900.00. Call to schedule your showing today! Well-kept 3/2 with office and dining room in Gardens of Manship. The spacious open living area features wood floors, high ceilings, a large granite island, windowed cabinet doors, and plenty of counter and cabinet space, and a separate pantry. The dining room is big enough for your large dining room table and china cabinet, and it has a beautiful wood plank ceiling. Just off of the kitchen is a separate office with a built in desk and drawers. The master bedroom will fit a king bed, dresser, and cabinet comfortably, and features a tray ceiling. In the master bath, you will find more granite countertops, a tiled shower, and jetted tub. The two guest bedrooms and bathroom are on the other side of the house, and the guest bath also has granite countertops. The back yard features a large covered patio perfect for entertaining or just relaxing after a long day. Offered at $240,400.00. This one won't last long. Call 601-540-1197 to schedule your showing today. Update: New paint, new lighting, and a huge price deduction! Beautiful home with a pool in gated Wright's Mill! Its a rare opportunity to get into Wright's Mill at this price. This 4br/3.5ba home is all on one level. It features high ceilings, tall windows, and an excellent split floor plan. The living/dining area has wood floors and plenty of room for your long dining room table and china cabinet. Off of the living area is an office with built-in cabinets and bookshelves. The large master suite features a tray ceiling, a recently updated master bath, and a storm shelter. The spacious kitchen has plenty of counter space, cabinet space, and a separate sitting area. Step out back to one of the biggest back yards in the neighborhood featuring a heated saltwater pool and hot tub! This house has a new roof, a security system complete with front door camera, a whole home audio system, and smart home wiring. Offered at $339,000.00. Call 601-540-1197 to schedule your showing today! Come and see this beautiful 4/3 one owner home in desired Grayhawk. All bedrooms and bathrooms are on one level. The first thing that draws your attention is the beautiful landscaping. Upon entry you will find a spacious living/dining room with extra high ceilings and heart pine floors. The living room opens up to the kitchen with tall, glass-pane cabinets. The kitchen features a gas cooktop, stainless appliances, and a large island with premium slab granite. This home has many custom finishes including upgraded lighting and plantation shutters. The large master bedroom features a tray ceiling. The master bath feature his and her granite vanities, a beautifully tiled shower with bench seat, and an enormous closet with built-ins. There are no small bedrooms in this house, and all bathrooms have the same premium granite countertops. A built-in office is just off of the kitchen. Step out back to a spacious covered back porch with brick pavers for flooring and an outdoor gas fireplace! The back porch is plumbed for gas and water, so it's ready for your outdoor kitchen. The house is wired for security and surround sound, and there is a sprinkler system installed in the yard. Grayhawk is an amazing family neighborhood with a community pool and playground just down the street from the house. Offered for $360,000.00. Call 601-540-1197 to schedule your showing today! Great curb appeal with custom finishes in Stillhouse Creek! This 2100 square foot 4/2 is meticulously cared for. When you step inside you will find beautiful pine floors throughout the living area and kitchen. The kitchen features slab granite with plenty of counter space, custom windowed cabinets, a separate pantry, and a built in desk. An exposed brick wall makes the dining area stand out. The spacious master bedroom has a tongue and groove tray ceiling. Inside the master bath you will find his and her slab granite vanities, a jetted tub, and a spacious closet. Upstairs is the fourth bedroom/bonus with walk-in closet. Convenient built in lockers with hooks are just inside the door to the garage. The back yard is one of the best in the neighborhood, with a large covered back porch with stained wood ceiling. This one has all of the features of new construction without the price tag. Offered for $259,900.00. Call 601-540-1197 to schedule your showing today! Great curb appeal in convenient Laurelwood! Come and see this well kept 3/2 that's in the heart of everything. Beautiful floors, crown molding, and a floor to ceiling brick fireplace make this one stand out from the rest. The spacious living room opens up to a dining/breakfast area. In the kitchen you'll find a microwave, stainless steel refrigerator, dishwasher, and lots of counter space. The master bedroom features a walk in closet, tray ceilings, and a master bath with dual vanities. The two spare bedrooms both have fresh paint. Step out back to a wood deck overlooking a big back yard. New roof with ridge vents was installed mid-2016. Offered for $169,900.00. 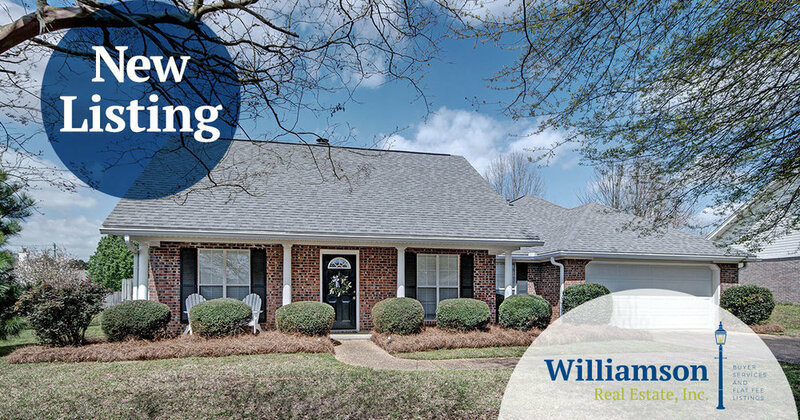 Call or text 601-540-1197 to schedule your showing today. Check out this five bedroom, four bath home on 2 acres in 39047. You'll fall in love with this one inside and out. It’s got a pool, a professionally installed playground, and lots of room for the kids. This is an amazing home. Beautiful Reunion Custom Home! This wonderful family home in Reunion has the upgrades to make it stand out from the rest. Upgraded light fixtures, heart pine floors, high ceilings, and an exposed brick wall and archway are just a few of this home's many features. The dining area has ample space for your long, two leaf dining room table. Your family will have plenty of room to relax in the spacious living area or the sitting area off of the kitchen. The kitchen features slab granite, an island, a six burner gas cooktop, double ovens, a built in ice maker, and custom cabinetry. Just off the kitchen is your wet bar and built in wine cooler. The family can stay cozy in the winter with two downstairs gas fireplaces. The spacious master bedroom features high tray ceilings. This unique master bath features completely separate his and her sides with a shared jetted tub, an enormous closet with tons of built-ins, and a roomy, tiled separate shower. No expense was spared with floor to ceiling windows and plantation shutters throughout. The owners also installed a custom tornado shelter off of one bedroom for extra safety. The large bonus is currently being used as a media room. Its pre-wired surround sound and enormous custom retractable projection screen will make family movie night or football weekends a truly amazing experience. The garage features a separate door perfect for your golf cart or zero-turn mower. Outside you will find screened in back porch, a stained and scored slab, and professional landscaping in one of Reunion's larger back yards. There is plenty of room for the kids to play in this one. For a change of pace, take them just down the street to the community playground. Reunion is full of extras for your family, and this home is one of the best it has to offer. Offered at $578,000.00. Call 601-540-1197 to schedule your showing today!